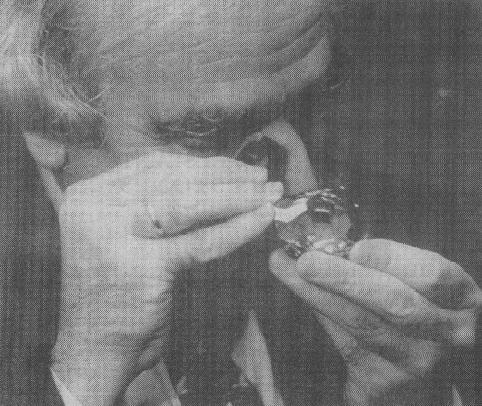 Gabi Tolkowsky examines the diamond with a jeweler's loupe. 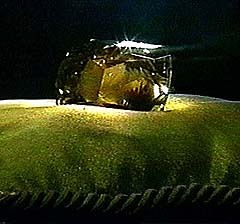 The Golden Jubilee is the largest faceted diamond in the world, weighing 545.67 carats. The stone was designed by Gabi Tolkowsky, who also designed the 273.85-carat Centenary Diamond, which is the largest D-Flawless diamond in the world. The Golden Jubilee was presented to the King of Thailand in 1997 for his Golden Jubilee - the 50th anniversary of his coronation. Prior to this event, the stone was simply known as the Unnamed Brown. 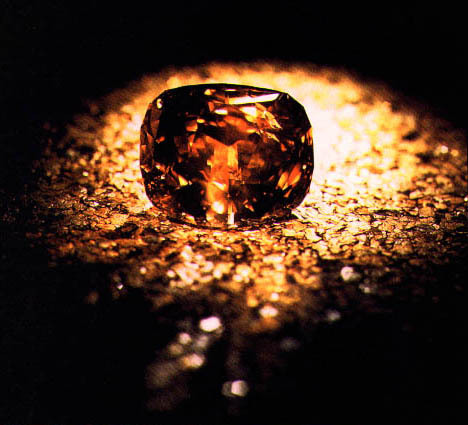 Tolkowsky describes the Golden Jubilee's cut as a "fire rose cushion cut." The color has been graded as "fancy yellow-brown", even though the above photo makes it look almost dark orange. It is only 15.37 carats larger than the Cullinan I, also known as the Star of Africa. A small photo of the Golden Jubilee I managed to salvage from the DeBeers website. Trivia Tidbit: The government of Thailand reported the stone as being a large golden topaz so as not to irritate the citizens -- Thailand has been in financial trouble for some years now, and the news of the purchase of the massive diamond would only make the popularity of the government drop. A barely decent photo of the Golden Jubilee sitting on a cushion. I wish the stone was more publicized because then I wouldn't have to settle for tiny or grainy photos.